When my son Grady and his wife Michele married they talked about having a large family. 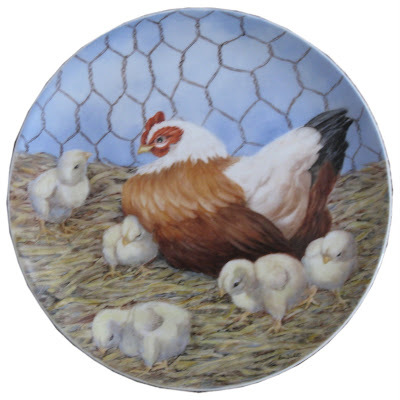 Michele wanted chickens painted for her kitchen and I gave her a tray with a rooster on it and then this large plate with a hen and many chicks. But....... now that they have two very active boys, we all wonder how parents of a large brood would survive???? I love them but get tired trying to keep up with them. I really enjoyed painting this and hope you enjoy it too.